Eating without any help is really fun with this fork and spoon utensil set from the babies' and children's collection Wildlife Turtle. 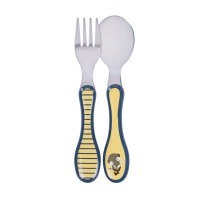 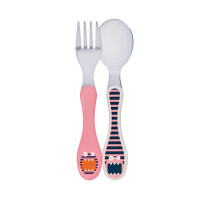 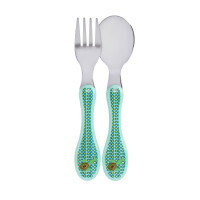 Product information "Children Cutlery, Wildlife Turtle"
description & equipment Everything tastes twice as good using this elegant fork and spoon utensil set which is available in different designs from the babies' and children's collection in addition to the other tableware products. The set, which includes a fork and spoon and is made of high-quality finished stainless steel with plastic handles, is resistant to bending, dishwasher-safe, and suitable for children aged 1 and up.